The National Labor Relations Board ruling that the Northwestern football team can unionize signals a massive sea-change in so-called amateur athletics. The experts said that the efforts of the Northwestern University football team to form a union would crash and burn. The experts scoffed that these naïve jocks would lose their case before the National Labor Relations Board. The experts all believed that this is what they call “settled law.” After all, since the 1950s, when the widow of a football player who died on the field of play failed in her efforts to sue the NCAA for worker’s compensation, it was clear to the courts that these were not workers but “student-athletes.” The experts were proven wrong on Wednesday and the established order in the sports world has been shaken to its foundations. The NLRB has ruled that& the Northwestern Wildcats are in fact workers. They ruled that since players do not get class credit for playing football and that they are given value for their time playing football, namely an annual scholarship that is worth over $60,000, then yes, they can organize themselves into a union. This decision marks the first real crack in the NCAA cartel in any of our lifetimes. It is also far from over. Northwestern University is leading the appeals process for now. They want the NLRB decision squelched for two reasons, both based in fear. They are afraid that if the football players can unionize, then the graduate teachers, the custodial staff, the work-study students and the cafeteria workers will all say, “If they can be a recognized union, then why not us?” That simply cannot happen in today’s neoliberal university system. Northwestern may fear those below them, but they fear those above them even more. That would be the Big 10 conference and the NCAA. If their football players are allowed to collectively bargain, the NCAA could shut them out, turning off the spigots from which the almighty revenue streams of cable television money seem to endlessly flow. Yet whatever response Northwestern is conjuring, it pales in comparison to the scorched earth about to be fired from the NCAA’s legal guns. For Northwestern, this jeopardizes the power arrangements on their campus, but for the NCAA, this decision threatens their very existence. 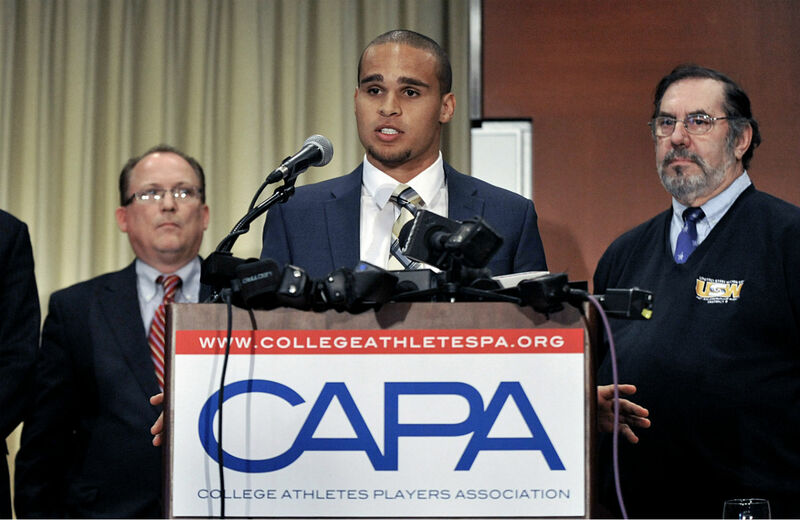 The NCAA is now in a fight for its life. Their power emanates solely from its position as a cartel. That means they have the controlling authority to hold every school to the same byzantine ground rules or suffer the consequences. This controlling authority is currently being crippled under the weight of its own greed. This controlling authority has created an unsustainable system of free-market, freewheelin’ capitalism for coaches and indentured servitude for players. This controlling authority allows the NCAA to turn its so-called student-athlete players into walking billboards for the pleasure of their corporate sponsors. This controlling authority has taken maximum advantage of the fact that the two revenue producing sports, football and basketball, tend to be populated by impoverished people of color. They have created a system of $11 billion television contracts where coaches make 100 times what they made thirty years ago. They have kept their foot on the gas, making and remaking conferences, destroying traditional rivalries and all with a short-term eye on the bottom line. Through it all they never reassessed the position of the players themselves and now they are paying the price. Pigs get fat, hogs get slaughtered. Imagine a college sports system where high school players could choose schools on an entirely new set of criteria. Maybe one school guarantees scholarships for all four years and that can be a point of attraction. Perhaps another highlights the fact that their coaches have their salaries capped, which allows for more money to go in a trust or stipend for players. What if some schools offer players a cut of the shoe money? What if the best players, as was suggested to me on twitter, now avoid the Southeastern Conference because of their state’s right to work legislation that make it more difficult to build a strong union? Would this lead a state like Alabama, where Crimson Tide and Auburn Tiger football is king, to repeal its antiunion laws in an effort to keep the best talent available? If nothing else, the end of the NCAA would open a gusher of money, and not only because that multimillion dollar legal war chest could be used for something more productive than enriching attorneys. Imagine the end of compliance offices, where schools spend hundreds of thousands of dollars annually to make sure they are “NCAA compliant.” Imagine head coaches who make less, boosters who pay more, and athletic departments emancipated from the cartel. The biggest canard of NCAA defenders is that if players get paid then all sports, particularly women’s sports, would be crippled. This is hogwash. These sports are already being crippled with over 90 percent of athletic departments in the red. We can do better. It is time for a new model. Thanks to the football players at Northwestern, we can now imagine there’s no NCAA. It’s easy if you try.